Heat oil in apan, add mustard seed,urad dhal, sliced onion, sliced tomato to saute few minutes. Add ginger gatlic paste, cubed capsicum, chilly powder & salt to saute until done. Serve with rice or chappathi or naan rotis. why dont u send it across to TongueTickler's Green event? nice colour will suit green event,..
Ohhh! looks so delicious and mouth-watering. wow, this looks so good. I will try this tomorrow as a side dish for rotis. Great way to use peppers! same typw i too make it...ur looks nice.. Very nice recipe, and look greattttt!!! 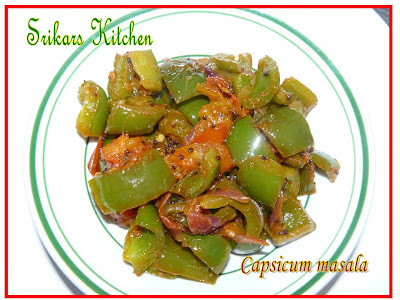 hi, just visited ur wonderful blog.ur capsicum masala looks yummy.